I grow chamomile mostly because it's pretty and easy to care for. It grows happily in my horrible red clay soil under my 80ft oak trees with their expansive root systems. Somewhere in one of my many herb books, I read about planting chamomile in your yard along with other low spreading herbs like thyme to make a useful and fragrant lawn. That's something I might do - about all I have out there now is clover and weeds! 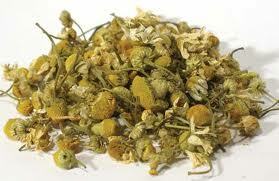 In addition to chamomile's pretty lacy foliage and little daisy type flowers, it's useful too. I actually dry the flowers to make tea. I like mine with lemon and honey and it is good for relaxing at night and relieves heartburn too. I found this recipe for a chamomile skin toner that I am going to try too. Place the chamomile in a pint jar, add the vinegar and close tightly. Put it in the refrigerator for at least 3 weeks and shake once in a while. After 3 to 6 weeks, strain out the chamomile and add the witch hazel to the vinegar mixture and stir. Mix 1/4 cup of this mixture to 2 cups of distilled water. Use after removing makeup to tone and smooth your skin. Keep in frig. The original undiluted chamomile mixture will keep for a year in the refrigerator. Cheap and gentle! 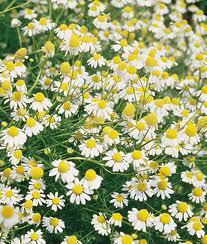 Warning: Don't use Chamomile if you are allergic to Ragweed, Chrysanthemums or Asters.